Cisco invests in scalable and self-sustaining programs that use technology to meet some of society's biggest challenges. We deploy our expertise, technology, partnerships, and financial resources to help build thriving, prosperous communities that improve people's lives and support our business. Our social investment programs focus on four areas where we believe Cisco CSR can add the most value and make a significant and lasting impact. 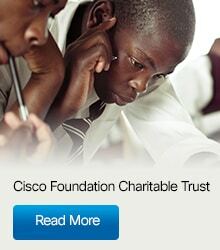 Cisco CSR education programs and partnerships improve access to quality education for students worldwide using the combined power of network technology and human collaboration. South Africa: When a young girl in South Africa discovered her passion for technology, she found a way out of poverty for herself and her family. South Africa: Ewert Tau Makgaile’s passion for technology led him from his childhood home to the city, where he pushed himself to earn an engineering degree with the help of CoachLab. Cisco Networking Academy: More than 33,000 students have taken Cisco Networking Academy courses at more than 50 learning institutions throughout South Africa. Cisco collaboration technologies bring healthcare specialists to the patients who need them, reducing the stress and expense of traveling to receive care. Investing in human potential through programs that use ICT to connect challenged communities and underserved populations to resources that change lives. South Africa: By empowering social entrepreneurs throughout South Africa, Siyafunda, in partnership with Cisco, has transformed government-run telecenters into hubs of economic vitality. South Africa: Meet Mankwe Mokgabudi and his extraordinary classmates, who broke the cycle of poverty with the support and encouragement of companies that need their skills to grow and prosper. Speeding the delivery of essential resources through ongoing programs and disaster response. Be the Bridge Campaign: Support for more than 400 nonprofits and non-governmental organizations (NGOs) worldwide through employee donations, volunteerism, and matching from the Cisco Foundation. "Our approach to Corporate Social Responsibility (CSR) is to use our expertise, technology, and partnerships to create positive impact around the world."